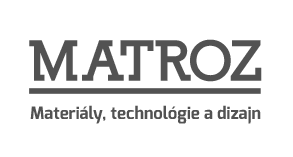 Abstract: Institute of Materials & Machine Mechanics (IMSAS) possesses the unique experience in the field of production of heating/cooling wall and ceiling panels based on aluminium foams for future autonomous houses and buildings. 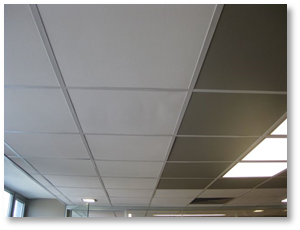 These novel heating/cooling panels have been developed and successfully tested in pilot application in 260 m2 open space office room. The low heat capacity of aluminium foam allows changing the temperature very quickly, whereas the temperature of the entire foam volume is always very uniform due to excellent thermal conductance of aluminium cell walls. The heat is transferred into or from the foam using foamed-in tubes, which are completely embedded in the foam, keeping excellent contact to cell wall aluminium. Good thermal conductance of the foam resulted in short length of embedded tubes, what is beneficial for low flow resistance and necessary pumping systems. The foamed panels can be partially impregnated at facing side by appropriate plaster, which improves the appearance and also serves as an absorber of potentially condensed air humidity. The developed panels provide an excellent alternative for large built-in ceiling radiators for efficient heating or cooling of rooms using low potential energy resources. The most appropriate ways of using these panels, which are able extremely to increase energy-efficiency in buildings has been outlined in this contribution. 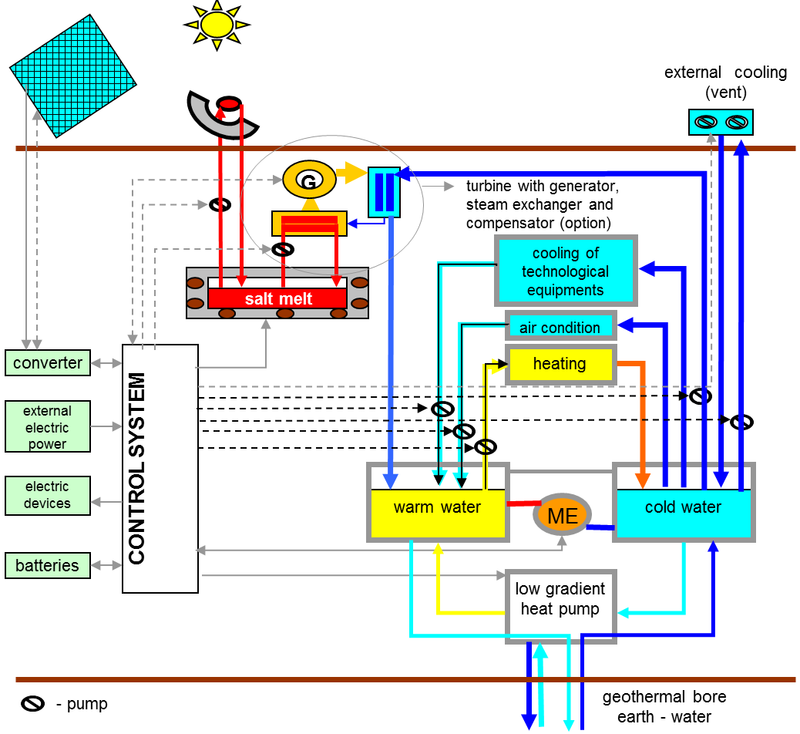 Moreover, patent pending technical solutions based on simple Combined Heat and Power (CHP) unit for storage/dissipation of thermal energy equipped with mechanical system simultaneously produced the electricity covering partially the needs of the house using lifting force of compressed hot/cold air, are firstly introduced to scientific community in this article. The future energy systems providing its supply to houses and buildings will be surely based on entirely CO2-free energy production. The development of energy storage and supply technologies should lead to economy based entirely on emission-free and inexhaustible energy sources, such as a solar, wind or geothermal. The electricity and energy efficiency to produce it will play still quite a long time an important role in fulfilling constantly growing global energy demand. The challenges of sustainability, such as climate change, diminishing natural resources and further negative environmental effects necessitate a transition from power production based on the use of limited energy sources obtained from fossil fuel combustion to the more efficient energy systems with significantly lower emissions. The future economy will utilise the sun's energy either directly as solar power or heat or indirectly as hydro-, wave and wind energy, bio-energy and geothermal heat. The future eco-cities will be based on smart grids with eco-efficient construction utilizing exclusively ecological engineering materials, sustainable methods of energy production, transportation and storage as well as various advanced energy efficient heating/cooling solutions. Generally, a net Zero-Energy Building (nZEB) is a building with greatly reduced energy needs through efficiency gains such that the balance of the energy needs can be supplied by renewable technologies . The building connected to a district energy system which receives high temperature heat as well as electrical energy and provides heat in the same quality (exergy) at a lower temperature and at the same quantity of electrical energy to the district, is not balancing the exergy of heat it receives and provides. This building is still impacting the environment because the negative exergy balance must be made up by the district at a cost of additional fuel spending and harmful emission even though energy amounts of the heat and power flow across the building district boundary are balanced. If the district generates power in the thermal power plant, and the building generates electric power in a micro-Combined Heat and Power (CHP) unit supported by using wind turbine, all have different environmental impacts and exergy. Therefore a Zero-Energy Building (ZEB) can be defined as a building, which has a total annual sum of zero exergy transfer across the building-district boundary in a district energy system, during all electric and any other transfer that is taking place in a certain period of time (A. J. Marszal and P. Heiselberg; 2011, ). In concept, energy needs for nZEB are greatly reduced through efficiency gains such that the balance of the energy needs can be supplied by renewable technologies. A nZEB optimally combines commercially available renewable energy technology with the state of the art energy efficiency construction techniques. There are no fossil fuels consumed in nZEBs and its annual energy consumption only slightly exceeds annual energy production. EU has adopted these concepts to define energy saving and climate-change goals within the building sector. This topic is addressed in the continuation of the Energy performance in buildings directive of the EU . ZEB has become by this way a general terms covering efforts significantly to improve the energy efficiency of buildings. According to Article 9 of the Directive 2010/31/EU of the European Parliament and of the Council of 19th May 2010 on the energy performance of buildings, even prescribes that in the end of 2020 should all member states of EU ensure that all new buildings are nearly ZEB, i.e. buildings that have a very high energy performance and nearly zero or very low amount of energy required should be covered to a very significant extent by energy from renewable sources, produced mainly on-site or nearby. 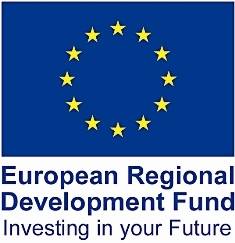 The member states of EU shall furthermore, following the leading example of the public sector, develop policies and take measures such as the setting of targets in order to stimulate the transformation of buildings that are refurbished into nZEB, and inform the EC thereof in their national plans. While fully energy-autonomous buildings – those not connected to an external energy infrastructure – the on-site energy systems (solar, wind and geothermal) as well as systems for energy storage must be dimensioned to guarantee the uninterrupted energy supply, the goal for nZEB is a neutral result for an energy or emission balance over the period of one year. This goal refers to calculated result for the balance between demand or consumption values and electricity fed into the grid. Interaction with an existing energy infrastructure is decisive to balance the energy supply and demand, both in terms of quantity and often also concerning the form of energy. The climatic condition in the Europe causes that seasonal compensation plays the dominant role from the energy point of view, whereas short-term equilibrating processes are most important regarding power. Seasonal storage within the building was unfortunately up to now deliberately omitted from the concept for nZEB. In particular, this could not be recently implemented rationally, as batteries are not suitable and building-integrated hydrogen systems are far from technical maturity , i.e. their excessively high price is today the main obstacle for their application and subsequent mass expansion in world markets. However, the feature that the nZEBs share with energy-autonomous buildings is the balanced energy budget, not just the low energy consumption as in the case of passive buildings. Of course, that achievement of zero balance with solar energy alone causes in most cases unreasonably high costs for the purchase of required energy producing and storage systems. The significant use of wind power directly at the building is also limited to a few special cases. However, the co-generation or combined heat and power (CHP) units integrated into the building energy systems are much more promising, specifically when they are based on renewable energy sources. They provide a number of new advanced technical solutions, one of which, based on the simultaneous utilization of geothermal heat obtained continuously from the earth’s crust in the immediate vicinity of the building, is presented in the Section 5 of this contribution. In countries with cold climate, space heating is a major energy consumer and thus a significant source of greenhouse gas emissions, i.e. emissions of any gases whose absorption of solar radiation is responsible for the greenhouse effect, including carbon dioxide, methane, ozone, and the fluorocarbons. CHP units as well as ground source heat pumps are generally seen to be among the best alternatives to reduce greenhouse gas emissions of space heating . For now, 50 % of European electricity production is based on coal or gas condensing. These production methods have the most expensive marginal costs and thus are run up or down first when the consumption changes. In the future, it is very unlikely that peak loads caused by electrical heating or heat pumps are covered by nuclear or composite current source power due to their high investment costs. Wind and solar electricity production need regulating power. Additionally, there is not enough hydro-power for the whole Europe to level the diurnal, not even to talk about seasonal variation. CHP is a very good alternative, when it replaces fossil-fuel condensing power. The more of the time it does this, the better it is in terms of CO2 emission reduction. The choice of heating system is not only dependent on economical rationality. There is normally only one district heating supplier in some specific area. To maintain the customer’s trust, feeling of empowerment and freedom of choice, there should be e.g. different billing alternatives (although preferably cost-correlated as exactly as possible), active client hearing and openness in every sense. These could help to make the district heating system feel like the customer’s own and flexible . thermal – capturing heat or cold to create energy on demand (thermal energy storage systems stock thermal energy by heating or cooling a storage medium so that the stored energy can be used at a later time for heating/cooling applications and power generation, they can help balance energy demand and supply on a daily, weekly and even seasonal basis, reduce peak demand, energy consumption, CO2 emissions and costs, if their overall energy efficiency is increasing). 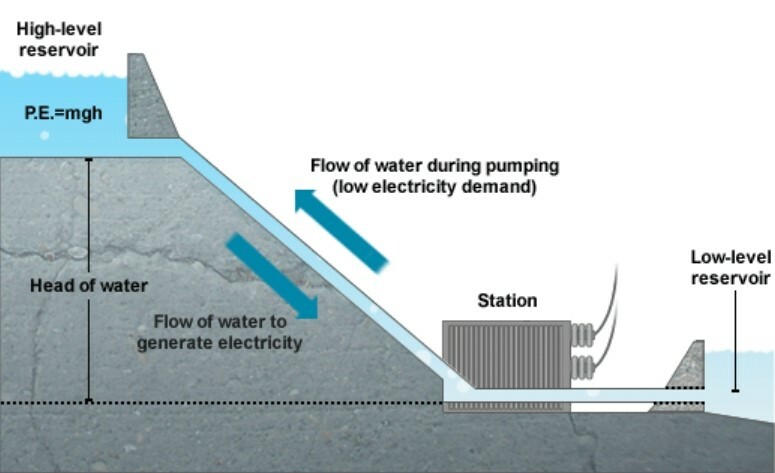 pumped hydro power – creating large-scale water reservoirs of energy (a hydroelectric dam relies on water cascading down through the turbines to create electricity to be used on the grid). The case study of this technology is shown in Fig. 1. Figure 1. The case study by which an American wind power produced in North Dakota is stored by hydro “battery” in Manitoba’s (Canada) hydro reservoir . Energy from batteries is most expensive in terms of cost per kilowatt-hours (kWh). Improved runtimes, lower unit price and the convenience of recharging have shifted many portable applications previously reserved for primary batteries to rechargeable batteries. Table 1 compares the cost of power with rechargeable batteries. The cost is based on battery price and the number of possible discharge/charge cycles. The analysis does not include electricity for charging or the cost of purchasing and maintaining charging equipment. The table compares commercial battery packs used for communications, computing or medical devices. Older technologies have lower cost per kWh than newer systems. With dwindling fossil fuel supply associated with the need to reduce greenhouse gas emissions, governments as well as the private sector are beginning to focus on alternate energies. If we compare the cost to generate 1 kW of power by taking into account the initial investment, adding the consumption of fuel and including the eventual replacement of the system, power from the electrical utility grid is most cost-effective (consumers in industrial countries pay between $0.05 and $0.25US per kWh of energy and typical daily energy consumption per household is about 25 kWh) . Flow batteries, such as vanadium redox flow batteries, are attractive due to their very long lifetimes even under consistently high discharge depths, their good scalability and their flexibility in managing power and storage capacity separately. They are generally not suitable for small-scale applications, however, and are therefore targeted more towards grid-scale energy storage. Drawbacks include fairly average round-trip efficiencies and significant costs for their operations and maintenance . The company Aquiron Energy Inc. founded in 2008 by Prof. Jay Whitacre from Carnegie Mellon University in Pittsburgh, Pennsylvania (USA), developed patented  Aqueous Hybrid Ion (AHI™) battery technology which provides high performance, safe, sustainable and cost-effective energy storage for a diverse range of stationary applications. Using abundant, nontoxic materials (such as manganese oxide, sodium sulphate, carbon and cotton) and modern low cost manufacturing techniques, AHI™ batteries are ready to take on the global energy storage challenge. Nevertheless, the excessively high price of batteries and building-integrated hydrogen storage systems is today the main obstacle for their application in small nZEB. The potential to reduce the energy consumption of small family house by storing energy obtained by renewable sources directly in the house or in its immediate vicinity is therefore extremely hard achievable target, if batteries, flywheels or hydrogen systems are used for this purpose. The energy storage systems based on compressed air energy storage, thermal storage as well as pumped hydro power storage seem to be unavoidable in order to have return-on-investment period below ten years in the case of small nZEB. 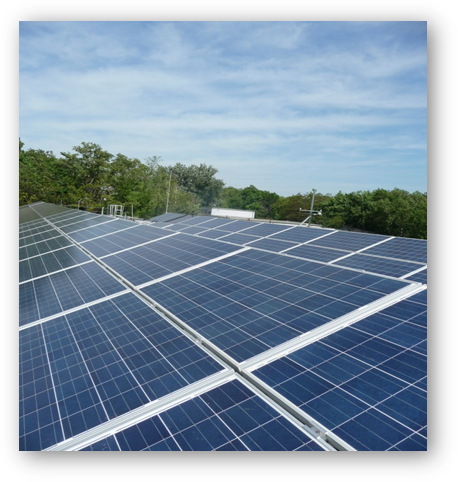 The most convenient way how to decrease energy demands in the buildings is the utilization of renewable energy sources – the solar, wind or geothermal one. A main drawback of the solar source is its irregularity whereas it produces a lot of excess heat during the peak time and during the night. This excess heat is almost not possible to use. 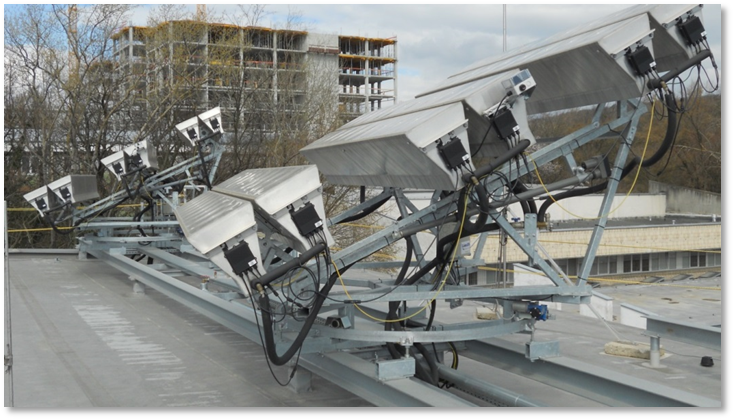 In case of cooling, it is an issue to eliminate overheating from the solar source during the day what also requires additional energy inputs. That is why it is important to focus on development of new systems which will be able to cover these natural energy fall-outs by storing and subsequent later evolving the accumulated heat or cold according to the day-night cycle. The thermal energy can be stored in standard buildings into massive inserts (i.e. clay bricks), but only sensible heat can be stored and the massive materials evolve this heat only in hand with continuous change of their temperature in this case. The sensible heat can be stored also if the Phase Change Materials (PCMs) are used for thermal energy storage. However, their most important property is the phase change solid-liquid and vice versa at the temperature range between 23 °C and 28 °C. During this change, a lot of latent heat is evolved or absorbed at almost constant temperature. The utilization of PCMs in larger volumes is strongly limited because of its low thermal conductivity. In this case solidification starts on the surface creating thus an isolating solid crust. That is why there is a need to combine PCMs and porous materials with higher thermal conductivity. Small empty pores can be filled with PCMs what ensures phase change in whole volume without creation of the isolating solid crust. The aluminium foam panels made by foaming of foamable precursor with stainless tubes embedded in the structure of foam are therefore promising solution for energy efficient heating and cooling of walls/ceilings in interiors of buildings. The huge application potential mainly in the building and shipbuilding industry is expected thanks to their quick response to temperature changes due to excellent heat conduction of porous aluminium structure, lightweight design, self-supporting capability as well as shape and surface flexibility. 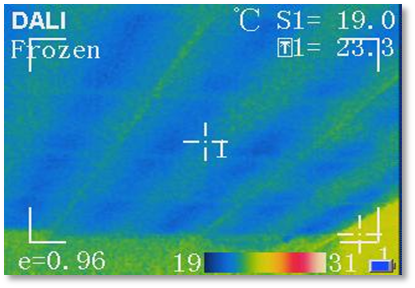 The large active surface of foamed panels with extremely quick response to temperature changes enables to use heating/cooling fluids with the temperature nearly the same as is the achieved and maintained room temperature of interior air. This allows to utilize various available alternative energy resources such as solar or geothermal energy very effectively for heating during winter, or even simply cold air during summer nights for cooling. The ceiling panels made of aluminium foam (Fig. 2) supplemented with system containing the heat storage reservoir enables significantly to increase energy efficiency of interior heating and cooling. Moreover, this system enables to spend or release into the interior certain amount of heat at constant temperature in the case that aluminium foam is filled with PCMs melting or solidifying at desired temperature. This feature makes possible in combination with smart temperature control systems further energy cost savings for heating/air conditioning systems of future nZEB. The patent application (PP 5040-2013, Inventors: J. Jerz and M. Bartko) "The method of operation of energy-autonomous buildings and power equipment" filled in December 2013 describes advanced technical solution for significant reduction of energy required for heating and air-conditioning of small nZEBs (Fig. 3). 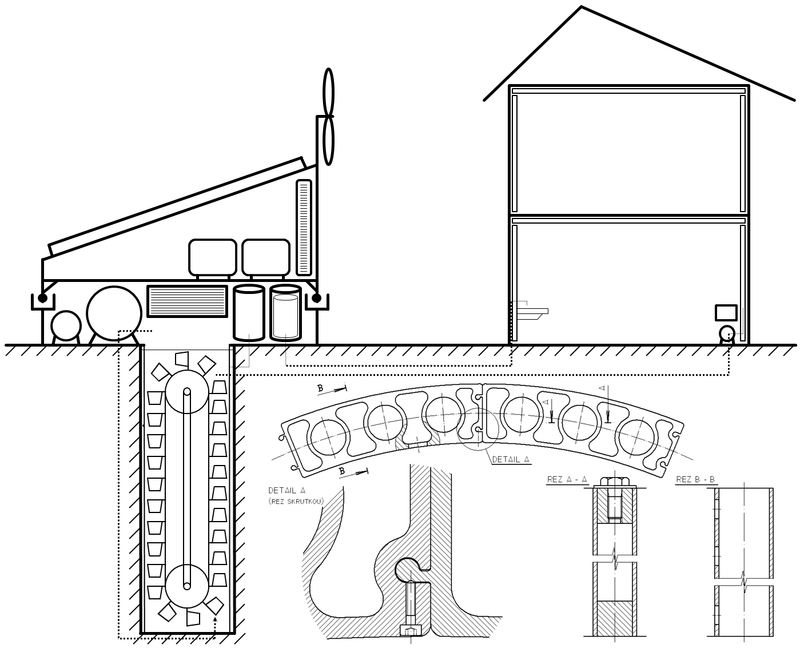 According to this invention, the portion of the excess energy obtained from renewable sources is stored in the form of compressed hot/cold air in small heated/air conditioned room built in the close vicinity of the building above the well equipped with mechanical system connected to an electric power generator. The abovementioned mechanism submerged below the surface of the well is a small CHP unit able not only to effectively store/dissipate the thermal energy into the water in the well, but also to produce the electricity covering partially the needs of the building using lifting force of compressed hot/cold air released from the bottom of the well. The walls of the well are due to sufficient conduction of geothermal heat from earth crust jacketed by hollow aluminium profiles with cavities filled by PCMs according to this patent pending technical solution. In order to test the various methods for production, transfer and consumption of energy obtained from renewable sources a Smart Grid laboratory (Fig. 4) equipped with 29 kW photovoltaic power plant, concentrated thermo-solar panels, heat pumps for conversion of geothermal energy from four drilled 100 m deep drill holes, heat storage vessels and advanced control units has been built recently in the experimental hall of IMSAS in Bratislava. For IMSAS this creates an extraordinary possibility to build up the unique competency in this rapidly developing and very important research field. The orientation of future institute’s research activities towards the research on advanced materials for the efficient use of renewable energy is thus foreseen. The aluminium foam heating/cooling panels allow changing the temperature of interiors very quickly thanks to their low heat capacity, whereas the temperature of the entire foam volume is always very uniform due to excellent thermal conductance of aluminium cell walls. The panels provide an excellent alternative for large built-in ceiling radiators for efficient heating or cooling of rooms using low potential energy resources. Porous structure of aluminium foam allows to evolve or absorb latent heat at almost constant temperature if pores are filled by PCMs with phase change at the temperature range between 23 °C and 28 °C. These features of aluminium foam panels in combination with smart temperature control systems allow significantly to reduce energy consumption for heating/air conditioning systems of future nZEB. The energy storage systems based on compressed air energy storage, thermal storage as well as pumped hydro power storage seem to be unavoidable in order to have return-on-investment period below ten years in the case of energy efficient small family houses. The invention "Method of operation of energy-autonomous buildings and power equipment" (PP 5040-2013) supports commercialization of advanced metallic materials utilized for significant reduction of energy needs and consumption in energy efficient buildings. This technical solution has a great potential to become the breakthrough by significant reduction of energy costs for building heating and air-conditioning, and thus in the case of its successful commercialization it may indicate the considerable shortening of the payback period for investment costs, especially in the case of net zero energy small family houses. 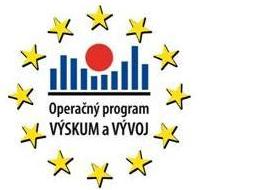 The article was elaborated within the financial support of European Regional Development Fund under the project “ITMS 26240220028 – Efficient controlling of the production and consumption of energy from renewable sources (ENERGOZ)”. Figure 2. 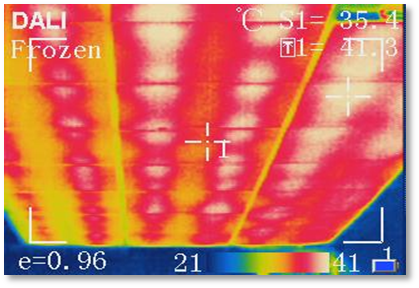 Distribution of temperature fields in the ceiling heating/cooling panels of aluminium foam captured using thermovision camera during heating (left) and cooling (right) in the open office space area 260 m2 of company Sapa Profiles in Žiar nad Hronom, Slovakia. Figure 3. The illustration of basic principle of patent application (PP 5040-2013) of the invention "The method of operation of energy-autonomous buildings and power equipment" filled on 18th December 2013 in Slovakia. Figure 4. Smart Grid laboratory equipped with 29 kW photovoltaic power plant established in the experimental hall of IMSAS in Bratislava. JERZ, J. - WILFINGER, B. – HULA, R. C. - IŽDINSKÁ, Z. Knowledge management strengthens development of innovative products with extremely high added value. In ICERI Madrid 2011: 4th international conference of education, research and innovation. ISBN 978-84-615-3324-4. JERZ, J. - OROVČÍK, Ľ. - WILFINGER, B. - HULA, R. C. Effective knowledge transfer of advanced technologies for production on innovative engineering materials into industry. In INTED 2012: 6th international technology, education and development conference. - Valencia: IATED, 2012. pp. 0737-0745. ISBN 978-84-615-5563-5.